This was a song I had been familiar with ever since its release in the Fall of 1981. 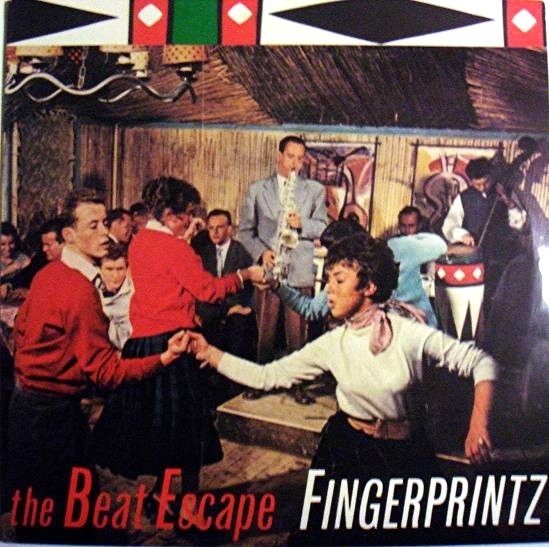 I first heard Fingerprintz earlier in the year when the Cash Cows compilation had featured the dazzling “Yes Eyes” from “Distinguishing Marks.” I was actually familiar with the pen of writer Jimme O’Neill from his songs written for Lene Lovich a few years earlier. By the time that I was a college freshman that year, their third [and final] album “Beat Noir” was released and I quickly grabbed the US edition on Stiff America, not knowing at the time that two tracks had been dropped for the US market. I was just happy to have this record, said to be a paragon of “Dance Rock” as it was known at the time. The US LP certainly lived up to that billing. I had never heard the 12″ versions of these tracks, but was more than ready to. “The Beat Escape” was another one of those distinctive 1981 high-pressure funk numbers like “Chant No. 1 [I Don’t Need This Pressure On].” There must have been something in the UK water that year. Probably just the prescient sense of what the Thatcher years would hold in store. For whatever reason, the tense, urgent funk vibe really prevailed. This track was all about the sybaritic escape of the dancefloor. We should be so lucky to hear its like in a club…even now! It was not heavy on the melody, but instead it was driven by a massive, stupid beat enlivened by massed handclaps and distant vocals chanting under the driving, insistent synth bass line. It was a demand to dance even before the falsetto vocals of O’Neill started in with their repetitive strains being the only melodic development in the entire track [apart from a scant seasoning of brass injections]. The 12″ version here was nothing too different from the 3:43 LP version. No remixing was done as the song was merely extended for 5:52, but saying “merely” is perhaps putting too banal a face on it. With a dance monster like this one, it’s insane not to maximize the pleasure. In a just world, this A-side should have seen significant club play, but the funky Scots were never trendy enough for that. Which was a shame, since the vibe here with synths relegated only to the bass and the drumming and guitars proved that synths were not necessarily the only way to roll in 1981 for a funky good time. The vintage cover art perfectly captured the coiled frenzy of the music within. The B-side was another track from the “Beat Noir” album with the dance-noir “Catwalk” extended for our listening pleasure. It’s an appropriately slinky number with brash sax interjections and breathy exhortations of the title by a female vocalist credited as “Sadie The Cat.” The real hook is the tight tremolo picking of guitarist Cha Burns. It’s a propulsive delight. The track had not been altered too much up to the point of what would be its cold ending on the LP. On the 12″ version, that’s just a false ending before a coda of slight dubbing and some appropriate film sound bites extend the track to a full 6:09. 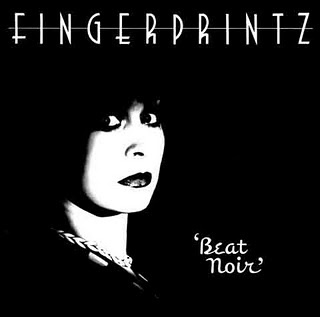 I have the second UK and edited US copies of “Beat Noir,” and I also have the “Shadowed” 12″ from that album, but there was an earlier release of the album where four tracks [“Disorient Express,” “Bohemian Dance,” “Coffee And Screams,” and “Madame X / Tickled To Death”] were swapped out for three tracks [“The Beat Escape,” “The Chase,” and “Get Civilised”] from a session later that the band felt captured something vital. It’s this early version of the album I need in order to make the ultimate CD of it. This entry was posted in Record Review and tagged 12" single, 1981, Fingerprintz, Virgin Records. Bookmark the permalink. Liked your comment re the feeling in the UK during 1981….it was a strange time and yes funk was breaking out all over the place. However the song that probably sums it up best is the non funky Ghost Town. Can you imagine that being number one and selling 100s of thousands of copies?? Those were very polarised times and that song was genuinely a glimpse under the (thin) veneer of Thatcher’s Britain! SimonH – I can’t deny the gripping power of that tune, it’s true. It hit me like a ton of bricks when it came out. It’s one for the time capsule and future sociologists will be able to tell a lot about that period by it. JT – I’m just amazed that they got Virgin to sign off on the idea. It could not have been cheap.